Rep. Sohn Hye-won again denied all allegations brought against her in a press conference in Mokpo, South Jeolla Province, Wednesday. Sohn is alleged to have used her influence as lawmaker to intervene in the designation of a dilapidated area in the city as a cultural asset. She is also accused of purchasing properties under the names of her family members, including a niece, in the area to profit from the real estate price increase expected after the area became protected for its cultural value. The allegations are currently being investigated by the prosecution. At the press conference, Sohn also suggested that she believes related news reports were designed as an attack against her. 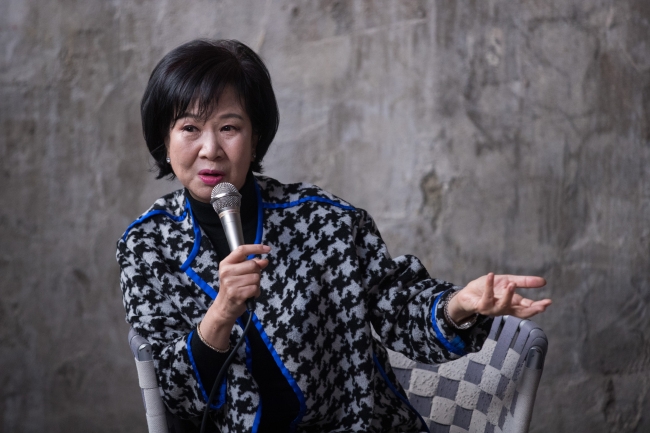 Sohn Hye-won claims that the concerned area being designated as a cultural asset interfered with plans for a high-rise apartment in the area, and that those with ties to the project hold a grudge against her. Opposition parties, for their part, continued to mount pressure on Sohn and the Democratic Party. “The four opposition parties are demanding a parliamentary investigation into the Sohn Hye-won scandal, but the Democratic Party is being irresponsible, taking the stance that the matter is not their concern as she has left the party,” Rep. Na Kyung-won, floor leader of the main opposition Liberty Korea Party, said. Meanwhile, minor conservative opposition Bareunmirae Party’s chairman Sohn Hak-kyu highlighted Sohn Hye-won’s connection to first lady Kim Jung-sook, in an apparent attempt to shore up the opposition parties’ call for an independent probe into the matter. Claiming that Sohn Hye-won became a lawmaker thanks to the influence of the first lady, Sohn Hak-kyu said that her connection to the first lady prevents a fair investigation. “When (Sohn Hye-won) announced she was leaving the party, Democratic Party Floor Leader Rep. Hong Young-pyo was there. This shows that Cheong Wa Dae and the first lady are behind Sohn,” Sohn Hak-kyu said in a radio interview on Wednesday. Hong had accompanied Sohn Hye-won to Sunday’s press conference when she announced that she will leave the party.